CPqD Campinas exposes accessible technology solutions for intelligent cities. CPqD Campinas received companies, researchers and public managers on Wednesday (13) for a showcase of technology and solutions already existing or under development for smart cities. “We have created a demonstration space for solutions. We have here eight companies and organizations that have solutions for smart cities that are already deployed elsewhere and that it is important to get to know them “, explains CPqD’s manager of business development in Intelligent Cities, Vinícius Garcia de Oliveira. In a space of 200 square meters, eight companies presented solutions to issues such as more accessible weather forecasting to prevent damage from flooding and landslides, optimization and saving of electricity in public spaces and even security monitoring by intelligent system. The CEO of Exati Tecnologia, Dênis Weis Naressi, presented a public lighting system with led with the possibility of saving up to 20% in energy consumption in bright places. The system was developed in partnership with CPqD and allows to reduce the illumination of public spaces at certain times. “One of the advantages of LED technology is the dimerization – reduce power – of the lamp. You reduce the lamp power and save energy in a few moments. this can be applied, “explains the CEO. The company still has a device that allows the public lighting network communication. One of the possible uses is in public squares with great luminosity in the nocturnal period. It is possible to program the lamps to have less power at dawn, maintaining basic lighting without compromising public safety issues. “You can still program the lamp to identify problems. It was defective, the closest team solves the problem. And you can measure energy too, ” completes Naressi. 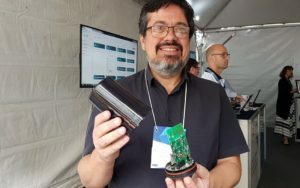 Startup Pluvion has developed a weather station that delivers more accurate weather data in a more affordable way to businesses, farmers and municipalities. The operation is integrated in a platform with different levels of contracted information. One of the goals is to reduce damage from weather phenomena such as post-storm flooding and landslides. Today, professional weather stations are expensive and cost up to R $ 20,000. The one developed by the startup costs up to eight times less, but the company offers a greater service in a platform that gives more precision with values ​​accessible even for small towns. “We have a much higher resolution. And what does this mean? In Brazil, the best resolution that we have delivered a different forecast every 10 square kilometers. And our system delivers a different forecast every 2.4 kilometers, “explains Pluvion CEO Diogo Tolezon. This greater precision helps cities and farmers to make faster decisions and with a greater margin of safety. And to get the most affordable system the startup also made a partnership with an Iceland forecast company. In the case of temperatures, the information can be given hourly. In relation to rain, minute and minute. Huawei’s director of solutions for government, Rildo Ribeiro dos Santos, presented a program that is being developed to improve and optimize the monitoring by cameras. The software allows the system to sound the “alarm” every time someone or some animal approaches an established area. “You will not have to leave a person all the time looking at a screen. The system will warn when someone enters that demarcated area as if it were a virtual fence, “says Santos. Another novelty presented makes the tracking of objects and animals indoors or outdoors. Beacons are light and discrete and can also track real-time development across a range of industries, including asset and company stocks. “It transmits information through Bluetooth and can be detected by any cell phone, tablet, computer or any device that has Bluetooth. 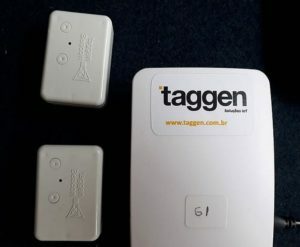 We can put in people or objects and detect where they are in an environment, “says Taggen’s chief technology officer, Mario Prado. The company is developing a form in badges or logos that allows, for example, a parent to find a child who has walked away in an environment.